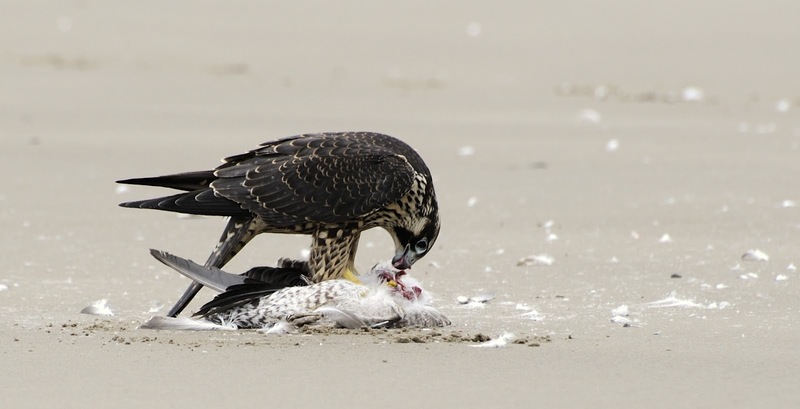 As a prelude to my post tomorrow about my recent Oregon and Arizona trips, I just couldn't resist sharing this awesome series of Peregrine Falcon images taken by my sister-in-law Rebecca Mortensen. Rebecca does photography semi-professionally specializing in newborn babies. We were taking a family hike along the beach searching for sand-dollars, checking out starfish, clams, and mussels and enjoying the cool wet sand between our bare toes. I saw a lump on the beach at some distance and without looking at it with binoculars I dismissed it as debris. Family members who looked closer immediately began to call for me to identify the bird eating something. We were able to approach fairly close without the bird being startled and saw that it was devouring a gull. The fact that a bird was eating another bird was kind of shocking for some of the kids. We watched the falcon deplume the gull and take long stringy red bites. Feathers were all over the place. It was a spectacle and a great chance to teach about the circle of life. Incredible photos, Robert. Thanks for sharing them on your blog. You all must've been so excited to be there at just the right time. Beautiful shots for the Peregrine Falcon! A bird eating another bird always strikes me as wrong, but that's just my anthropocentric prejudice. Quite a sight to be sure! Outstanding photographs!